Workspace iBroker is an Insurance Broker Software Tool, which is member of the Workspace Software Framework. This module is the Receivables side of the brokerage business. This module manages the Payables side of the brokerage business. Risks are organized into risk classes for ease of setup. When a risk class is fully configured, a risk that belongs to that class inherits the cover template automatically when added. Customization can then be done for each policy using the negotiated specifics. The Vehicle Records Costants are setup to enable the detailed recording of Motor Vehicle policies. The constants setup in these sections are used on capturing the policy risk schedule when the policy class is Motor Vehicles. 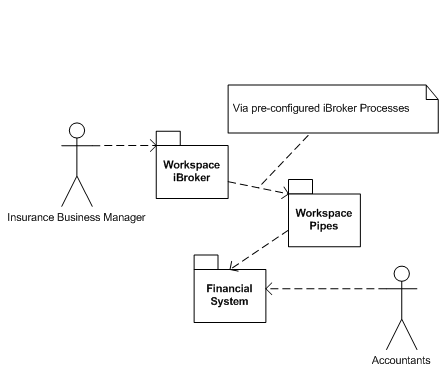 Workspace iBroker is designed to seamlessly integrate with the clients existing Financial system. We achieve this integration using Workspace Pipes Systems Integration Tool. Post Receipts: Post Receipts into the Accounts Receivable or Cash Book depending on configuration.